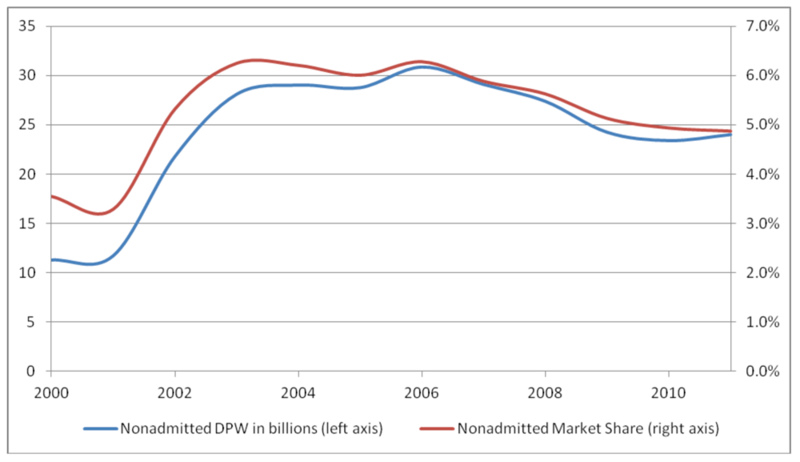 Property Casualty Insider » A “New Normal” for the Nonadmitted Market? A “New Normal” for the Nonadmitted Market? Despite some ups and downs, the first decade of the new millennium was a good one for business volume in the nonadmitted market. Nonadmitted business (defined as any business written by an unlicensed company, excluding RRGs) soared from $11 billion in 2000 to $24 billion in 2011. 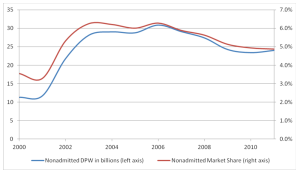 Viewed differently, from 2000 to 2011, nonadmitted premium volume grew at a healthy 7% annual rate. The growth, however, was uneven. As can be seen in the figure below, most of the gains came during the hard market of 2001-2004. The experience since 2004 has been one of fitful retraction, as softening market conditions have led to shrinking E&S premium volumes. It is easy to forget that the growth of 2000-2004 was so spectacular that now, even after some lean years, the nonadmitted market is still far larger than it was in 2000. The nonadmitted market is also far above its historical norms in relative terms. Industry veterans often use 3% as a reference point for “normal” market share when measured relative to the total property-casualty market (including both personal and commercial lines). As seen in the figure, we are now close to 5%. After the liability crisis of the 1980’s, the market returned to pre-crisis levels rather quickly: Data from A.M. Best suggests that the market share was back to 3% by 1988, just a few years after the peak of the hard market. Yet, quite some time has passed since the peak of the 2001-2004 hard market. Is 5% a “new normal” for the nonadmitted market? Ongoing intensification of the property catastrophe problem, as continuing growth in high risk areas interacting with rate and form regulation are forcing more commercial business into the E&S market. On the third point, at least, we can find some corroborative evidence. Nonadmitted premiums in property lines—which I’ll take for the sake of purity to be Fire, Allied Lines, and Earthquake—grew from about $1 billion in 2000 to nearly $6 billion in 2011, while non-admitted premiums in key liability lines (Medical Malpractice, Other Liability, and Products Liability) grew at a much slower rate—from $6 billion to $13 billion over the same period. To some extent, this reflects a rise in the relative importance of property insurance in the overall property-casualty market, but it also reflects the rising importance of nonadmitted insurance within the property market: Nonadmitted share in the property lines above rose from 8% in 2000 to nearly 15% in 2011, while the corresponding figures for the liability lines were 17% and 22% respectively. At a more granular level, we can also see the rising importance of nonadmitted insurance in catastrophe-prone states. For example, if we restrict our attention to the southeastern United States, and in particular the stretch of hurricane exposed coastline running from North Carolina to Texas, we see that all of these states experienced rises in nonadmitted market share that exceeded the national average. In fact, nonadmitted share more than doubled in all of these states except for Alabama and Texas. Thus, the thesis of growing catastrophe exposures, as well as awareness and sensitivity to those exposures within the insurance industry contributing to E&S growth, seems a plausible one. Moreover, the recent experience with Hurricane Sandy, especially the failure of hurricane deductibles, suggests that the freedom of form and rate offered by the nonadmitted market may become more compelling in the affected states going forward. Time will tell whether these structural changes in the insurance market have really produced a “new normal” or not. Working in the opposite direction, of course, are the usual mechanics of the soft market, in which standard companies’ risk appetites expand at the expense of the E&S market. Indeed, despite the uptick in E&S premium volume in 2011 and other signs of “green shoots” in the market, nonadmitted market share slipped ever so slightly from 4.94% to 4.87%. It may be some time before we know whether this was the initial sign of stabilization at a “new normal” or just part of an ongoing slide to the old one.